Taking your Workday to a Whole New Level! Are you worried that your sitting on the job all day might be hurting your health in the long run? It can, but it doesn’t have to. With chiropractic care and some healthy tips, your desk can be a healthy place! 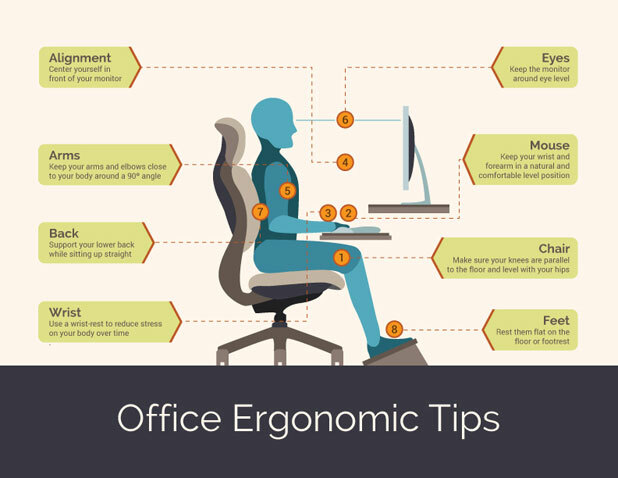 A healthy workplace goes beyond ergonomics, so let’s talk about tips to enhance your work environment. There are countless individuals in the world today who experience back pain from sitting down at work too much. This back pain can be caused by an unhealthy spine and nervous system. The spine and nervous system both take a hit when a person sits for a long time and doesn’t get up to move. We’re designed to move. When your spinal joints don’t receive proper movement, your muscles and joints can become tight and sore, making it difficult for you to perform your work responsibilities at a high level. Your chair: Make sure your knees are parallel to the floor and level with your hips. Your mouse: Keep your wrist in a natural position and your forearm in a comfortable level position. Your wrist: Use a wrist-rest to reduce stress on your body over time. Your posture: Center yourself in front of your monitor and sit up straight. For those who stand all day, remember this: Put your foot up to rest, stand on something soft and wear supportive shoes! Getting up from your desk and moving is vital for a healthy spine and nervous system. Take a quick break every 30-60 minutes to go up and down the stairs, do a few pushups, or walk around the block. At lunch, try to walk or stay active rather than sitting during your break. It’ll cram in a little exercise to boost your metabolism and give you a refreshing boost of energy. It’s no secret that we need to drink plenty of water, yet so many of us have a hard time getting enough water each day. So, make it a routine to grab a huge water bottle and mark how much you should have at different times of the day. Staying hydrated is good for your health and mind, especially when you need to focus on work. And, it helps reduce your appetite. Remember, having a healthy spine and nervous system starts with a healthier approach at work. Using proper posture, getting up to move, and drinking plenty of water will nourish your spine, activate your nervous system, and allow you to enjoy health from the inside out! We’re dedicated to helping your body heal naturally and stay in great shape. Come in for a visit and ask us how we can help you stay healthy and happy even if you sit all day!